A few days ago, we had an ‘uchiage‘ party for the Thermal Lab members to celebrate the ending of our grad thesis` and presentation the week before. Our lecturer booked a place at a ‘yakitori'(something like our satay) place and after everyone gathered at the station, we walked together with our lecturer to the party place. To a coincidence, the Control Eng. Lab were having their party at the same place too, at the same time so we combined our party since that they had only 3 members including their lecturer. The more, the merrier, isn`t it? 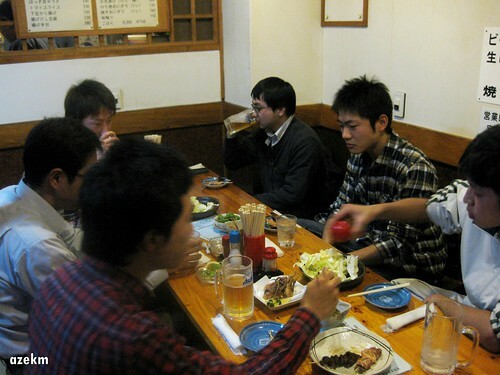 During party like this, my Japanese friends and lecturers as usual had their favorite beers, while had the ice-tea. 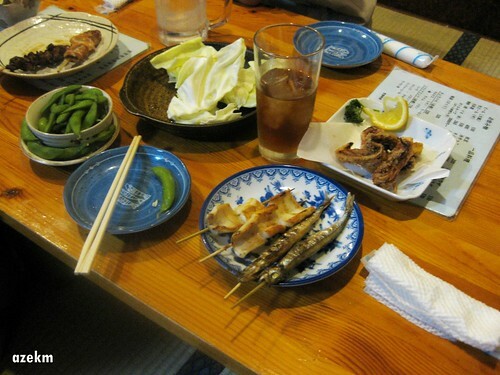 For the food, they enjoyed all the grilled-chicken and meat, and I settled with seafood grills. We chatted all the way through the party, about mostly everything, from our backgrounds, about life, friends, girlfriends etc, which we couldn`t usually talk during normal days at college and it was fun. The party lasted for about 4hours, and at about 1030pm, our lecturers made their move home early as they have to go to work again the next day and left the six of us wondering what to do after that. Everyone felt that it was still early to go back home, so we decided to go do something together since that there are only little time left for our college student life. 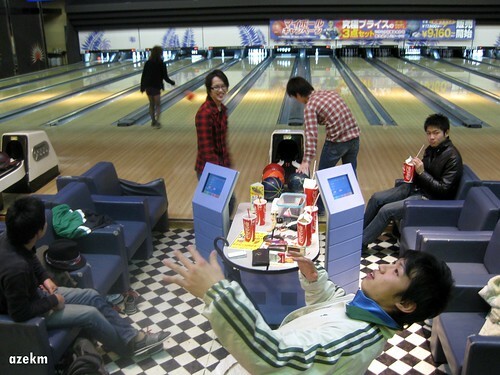 We had the option of karaoke and bowling, and after some ‘discussion’, the greater number of us opted for bowling. The six of us then packed into our friend`s cute Honda Life and off we went, being very careful not to bump into some patrolling policeman. 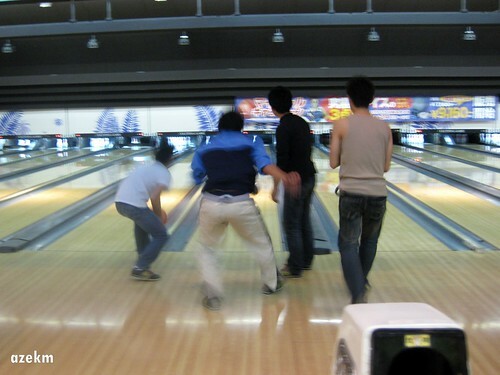 Luckily we didn`t find one and we arrived at the bowling center safely. For my other friends, they expected they wouldn`t manage to catch the last train to go home, so they rather play the 5 games pack to kill the time there and later go back to sleep at the college labs. We took turns to bowl and played the first 4 games normally. During that time they were some hilarious moments that made us burst into laughter. 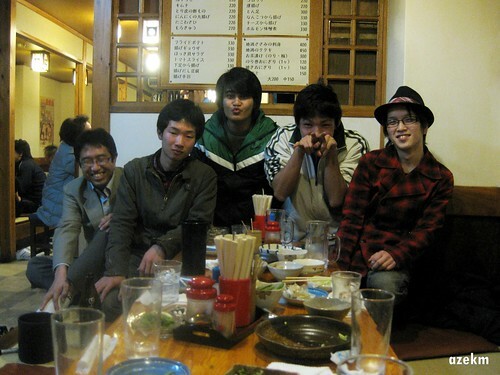 Most of them came from our friend Kubo who was drunk. 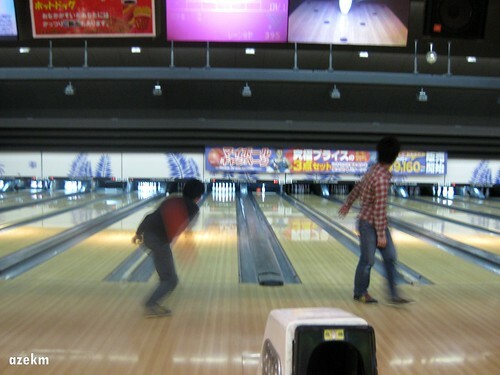 He would fall and slide into the lanes mostly every time he bowled. And there was one time he accidentally threw the ball into the lane next to the lane next to him!Hahaa! 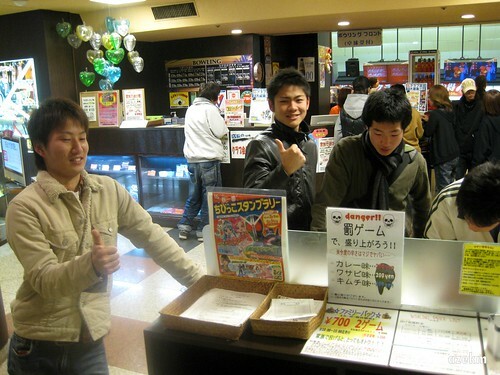 It was different case withmy lab mate Eiji, who was ‘bullied’ by the others during the games. 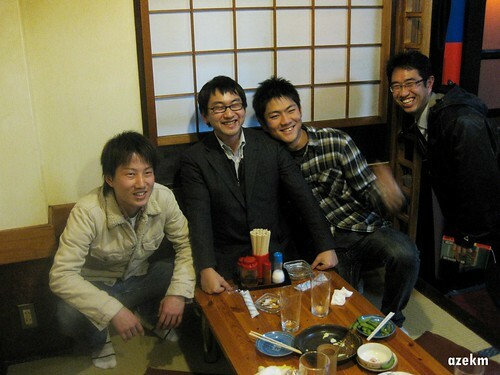 It was not the only time he got bullied by his classmates as he is originally the ‘bullied child’ in our class. I know that they were only joking with him, sometimes I pity him for getting picked all the time. But, like Natsuhiro said, “Eiji looked very happy getting picked”, he sure looked happy when everyone teased him. For the 5th and last game, we thought of having a competition among us. To make it more interesting, we decide that the bottom 2 person would have to treat the top twos for two tries of the “UFO-catcher” games. 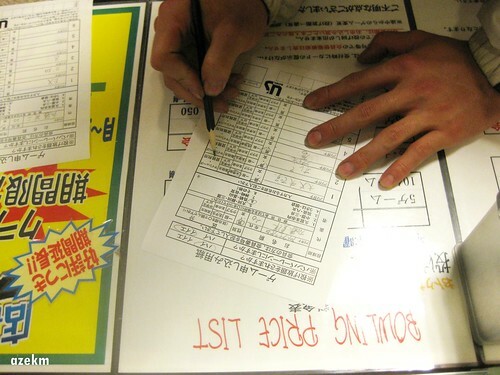 To ensure that it would be fair for all, the condition is that everyone had to throw with their left hands. Though I didn`t score well in the early frames, I manage to get 2 straight strikes after that which really bounced up my scores, and the result, I got the top 2 together with Natsuhiro. 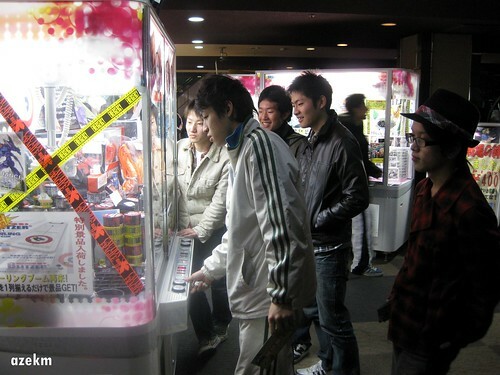 After the game, we the winners got to redeem our ‘prizes’ and we tried our “un” at the “UFO-catcher”. But to our bad luck, none of us manage to get something from the machine. 残念..